Farmer from a Farmer Field School in Sinhanhe, Mozambique preparing the fields. The Adaptation Learning Program (ALP) for Africa aims to increase the capacity of vulnerable households in sub-Saharan Africa to adapt to increasing and uncertain climate change and climate variability. Since 2010, ALP has been working with communities, government institutions and civil society organisations in Ghana, Kenya, Mozambique and Niger with outreach to other African countries. ALP develops innovative community-based adaptation (CBA) approaches and strategies with farming and pastoralist communities, and promotes their integration into local and national government systems and programmes. Adoption at scale is achieved by generating evidence of impact and good practices for CBA, building capacity and influencing development and adaptation policy and finance nationally and globally. 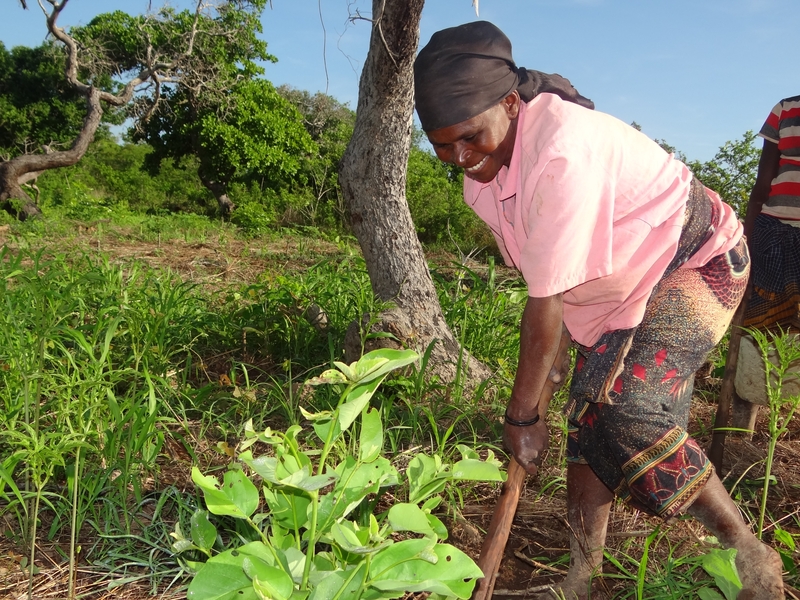 ALP work focuses on gender equality, strengthening adaptive capacity, access to useful climate information, multi-stakeholder decision-making and facilitation of learning for climate resilient agriculture, risk reduction and resilience across Africa. Innovating approaches for strengthening adaptive capacity, resilience, and gender equality, including access to climate information. Demonstrating scaling up of good practice for integrating Community Based Adaptation (CBA) into small-holder agriculture, local development planning and disaster risk reduction (DRR) systems. Over 1.5 million people in sub-Saharan Africa benefitting from community based adaptation approaches. 28,000 vulnerable people directly engaged in climate resilient livelihoods, e.g. early maturing seeds, conservation agriculture, and inventory credit. CBA adopted in national policy and plans in Ghana, Kenya, Niger and Mozambique. Providing value for money – every $1 invested in strengthening adaptive capacity and decision-making delivers $4 of social, environmental and economic benefits. CARE International developed the Community Based Adaptation (CBA) framework below in 2009. It has been a useful guide for ALP’s CBA work, representing the holistic and interlinked nature of CBA. Promotion of climate-resilient livelihoods strategies such as diversification of land use and incomes. Disaster risk reduction strategies to reduce impacts of increasing climate-related natural disasters on vulnerable households. Strengthening capacity in a) community adaptive capacity and b) local civil society and governmental institutions to better support communities in adaptation efforts. Local and national level empowerment, advocacy and social mobilization to: a) address the underlying causes of vulnerability, such as poor governance, gender-based inequality over resource use, or limited access to basic services, and b) influence the policy and enabling environment. Adaptation planning and action in all of these components is informed by climate knowledge and risks - in addition to the range of information on local context and conditions, underlying causes of vulnerability and the enabling environment. As outlined above, CBA involves an integrated response which combines livelihoods and DRR strategies with building adaptive capacity and addressing the underlying causes of vulnerability, all of which is informed by climate knowledge and understanding of risk and uncertainty. CBA approaches are inclusive and participatory in order to facilitate meaningful involvement of all community groups, particularly the most vulnerable, alongside other stakeholders in the planning and decision making process. CAAPs are developed by communities through a participatory planning process involving; climate variability, risk and capacity analysis, future visions for development, and feasibility assessment of options. The CAAPs record priority actions selected by men and women to build household and community resilience to the impacts of climate change. Multi-stakeholder PSP forums combine and translate indigenous and scientific seasonal forecasts to provide locally relevant advisories that are disseminated through new communications channels (radio and mobile phone) to inform livelihood and risk reduction decision making and plans. Village Savings and Loans Associations (VSLAs) build women’s economic and social empowerment through a systematic and group owned savings and credit system. Linked to adaptation, VSLA’s support climate resilient income generating activities and provide cash for social protection in the face of new risks. Integrating adaptation into local development planning ensures mainstream development and sector specific plans are climate resilient and responsive to community priorities. It increases the efficiency and impact of CBA and strengthens institutional linkages. Climate Field Schools increase farmers’ knowledge of climate trends and impacts and their ability to use climate information for agriculture decision-making. CFS builds farmers capacity to access and innovate technologies for climate resilient agriculture resulting in more secure livelihoods and greater food security. Community based early warning systems bring a climate lens to community based disaster risk reduction (DRR) and early warning systems (EWS) to increase people’s capacity to predict, prepare for and respond to climate extremes and deal with uncertainties and risks. Community rain gauges provide valuable information for early warning and for household decisions on risk management. I really credit the Village Savings and Loan Association (VSLA) / Village Community Bank (VICOBA) appraoch as it really works for both rural and urban centers in Africa. I happen to work with VSLA groups in the Karamoja region. After a series of conflicts and cattle rustling incidents we came up with the idea to engage with and inform the conflict survivors of the benefits of saving money for future operations, and how this can be done through VSLA approaches. They have since formed groups and are practicing income generating activities alongside VSLA. The next effort I will be trying is introducing VSLA initiatives to the mobile pastoralists of Karamoja. In this matter I strongly believe it will work, although it will require more attention since the VSLA approach needs an income activity generating money or some other assets that can be saved in monetary or assets/ materials form. This is a great initiative my friend. I have worked in Kitgum district in 2008 and was very surprise by the local expertise all over the northern parts of Uganda. Since our project valued a participatory approach of development, our interactions with the local communities was very smooth due to the inclusion approach we presented. I truly believe that pastoralists, farmeurs in general represent an important factor of development and source of food security in that region of Uganda. I would be more than happy to connect and exchange with local experts and community leaders on climate resiliency and youth engagement.